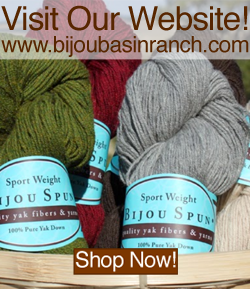 Bijou Basin Ranch: New Year's Yarn Sale! Happy New Year! We can't think of a better way of welcoming 2016 than starting a new knit or crochet project with some luxurious yarn. And if your resolution just happens to be to add more (yak) fiber to your diet, you are in luck: now through January 31, we're offering 15% off all yarn orders when you enter FIBER at checkout. 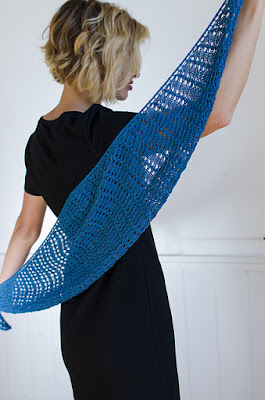 Since the hardest part is probably deciding what project you want to make next, we'll make it easy by sharing some great patterns using Bijou Basin Ranch yarn which you may have missed last year. 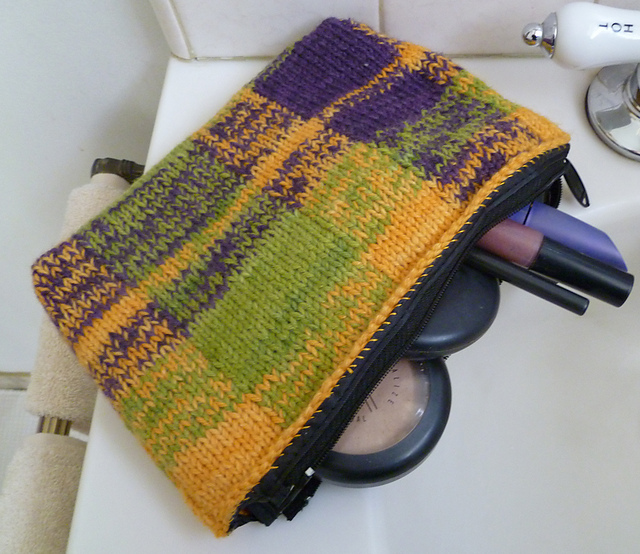 Gwen Bortner's Plaid Covered Bag is a clever way to upcycle using 3 colors of our Lhasa Wilderness yarn from the hand-dyed Outlandish collection (shown here in Lira, Roger & Louis XV). This free knitting pattern by Heidi Gustad, the Top Notched Shawl, was designed in a one-of-a-kind color way of our luxurious Shangri-La yarn. 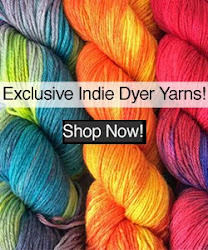 We think it would look fabulous knit up in two of our hand-dyed colorways from Lost City Knits, available here! Miriam by Jen Lucas is shown here in the Dinna Fash colorway from our Outlandish Collection of Lhasa Wilderness yarn, but substituting one of the hand-dyed color ways from Lattes & Llamas would add visual interest to this simple knitted shawlette. The stunning Beachcomber Skirt by Jane Howarth appeared in the Winter 2016 issue of Interweave crochet; the great thing about this garment is that it's crocheted with our yak and bamboo blend yarn, Lhasa Wilderness - so it can be worn year-round! Kristin Omdahl's Heather Plum hat is a beautiful lace beanie worked in Lhasa Wilderness yarn. Kristin employs her famous seamless construction in this top-down hat which stitches up in a jiffy.You can find the pattern in her newest book, Continuous Crochet: Create Seamless Sweaters, Shrugs, Shawls and More with Minimal Finishing. 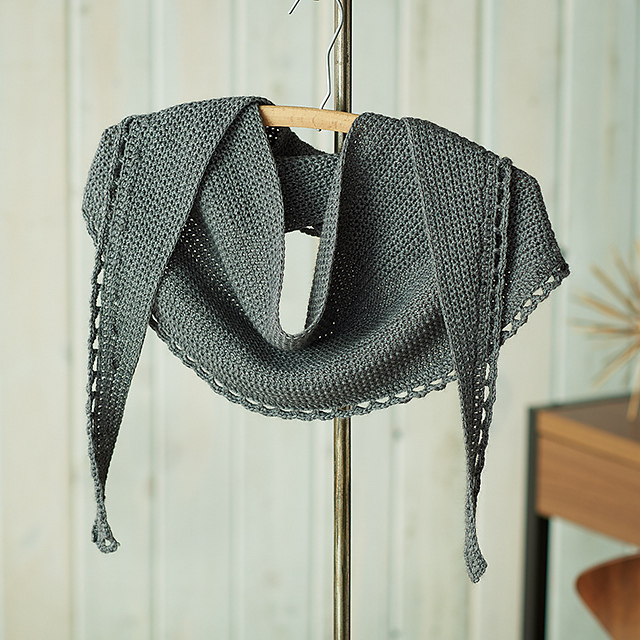 The Simple Lace Edged Shawlette by Marly Bird would look great in just about any color of Lhasa Wilderness yarn, from our semi-solid and tartan colorways of the Outlandish Collection to the uniquely variegated hand-dyed colors from Lattes & Llamas. On a different note, we'd like to invite our Colorado neighbors to a unique event called Knit Nosh which will be taking place in Longmont on January 23rd. 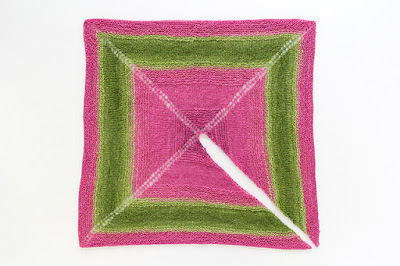 Knit Nosh is a food, wine and yarn tasting featuring small plates of great food, small tastes of wine, and yarns dyed by Colorado fiber artists. Bijou Basin Ranch is proud to sponsor this fun event; tickets are still available via their website - we hope to see you there!